When I eight years of age our family moved home and I had to start at a new primary school. It was Term 3. I remember my first day quite well. I was in 2nd grade and the name of my teacher was Sister Philomena. The classroom was cold and dark with high windows. It was known as the “basement” and it was later converted into toilets. 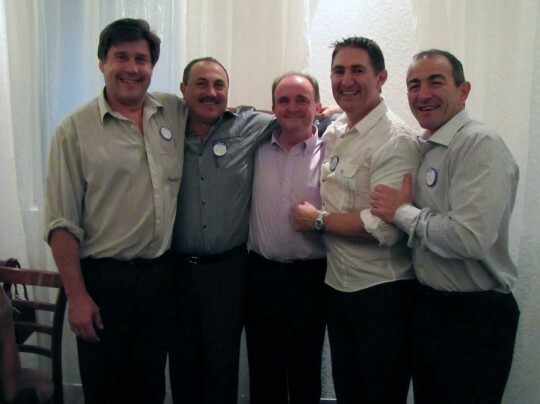 Gino, Ernesto, John, Sammy and Mario. Still together after more than 45 years. An Australian boy in a Mediterranean sea of manhood! However, it was not all doom and gloom in this new school for a small sensitive boy. Every member of the class was given a “reader” called Open Road and I thought it was the most fantastic book. Some of the stories have stayed with me all my life. In recent years I have always kept an eye out it for it in second hand book stores and I have also searched for it on the web. To no avail. I mentioned this in passing to my older sister Margaret recently and she replied that she had kept my copy of the book, along with my Kindergarten and 1st grade readers! Excellent! Thanks Margie! Margaret is a kindergarten teacher. I am one of seven children. Six teachers and one librarian. 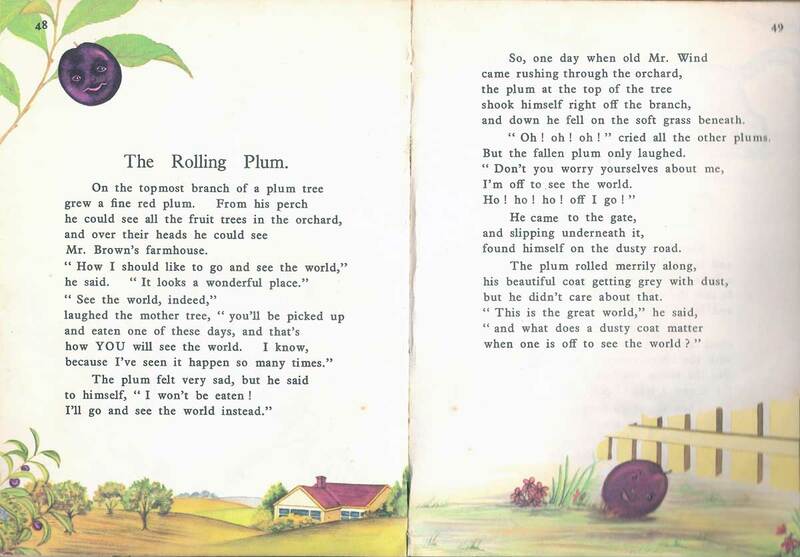 One of the stories that always fascinated me was “The Rolling Plum“. It is the story of a plum that decides he is going to see the world. The idea of a plum rolling from one place to the next captured my imagination. This plum had balls, per se, and it was determined to leave the tree and head for the road, channeling Jack Kerouac no doubt. I guess that this little roaming plum caught my eye because I had recently moved to a new home just metres from the beach, paddocks, tracks, sand-hills, creeks, coastal rock shelves, a playground and a football field. Freedom! I too could be that rolling plum. 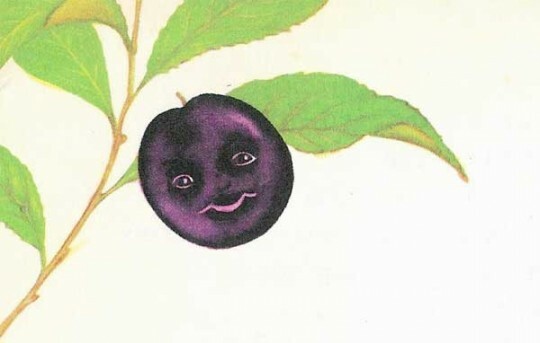 After his travels far and wide the Rolling Plum eventually found his roots and settled down with a worldview quite unlike that of his fellow plums. You can read his story by exploring the gallery at the foot of this post. The rolling plum evades capture once more! Do you remember the Rolling Plum and Open Road? Would love to read your recollections. Please leave a reply below with your own stories! Much appreciated! Thank your for capturing “The Rolling Plum” for so many of us,fellow nostalgics! sharing the Kindergarten reader with us? I can’t believe there is another person out there who remembered the book ‘The Open Road’ I went to school in the early sixties – Crown Street Public school and loved the stories – to date I’ve been trying to find a copy but with I luck. There was another fantastic story – I think it was called the 7 Chinese brothers and they lived on a parosel? The Open Road I remembered was yellow with kangaroos all over the front. If youre able to copy some of the stories and post them in line it would be wonderful – can’t believe almost five decades later and people can still remember this fabulous. Book. Thank you for posting some of the extracts. Thank you for your comment. It is an amazing book. The story of the 7 Chinese Brothers does not appear however it does ring a bell with me. I shall scan some more stories and share them Irene! 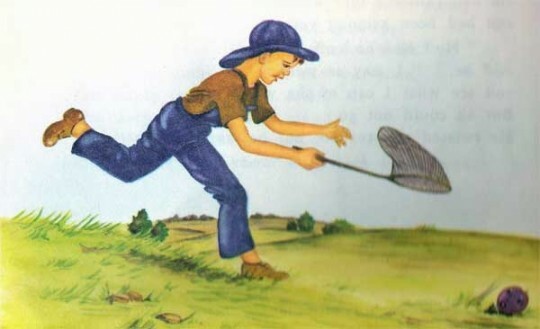 Please help me locate the Open Road series of books from my childhood. I would love to purchase them. I have looked high and low in second-hand book stores and op-shops to no avail. That’s one tough and plucky plum! Did it roll past the Dog on Tucker Box? I enjoyed the visuals describing your first days in the new school- it jumps to the modern photo of you and Gino with? his siblings? What is that story? You all reconnect or never lost touch? Stories, stories, stories, never get enough. We all attended a reunion not long back and we are all getting together again in October, Alan. That is Gino with three other Italian boys from our class. It was quite a multicultural class. The plum never made it past the dog on the tucker box! Couple of more stories to come that almost seem to predict life ahead. Thank you Denyse. I remember Gay Days from Kindergarten as well. Sadly I do not have that copy however I do have a copy of “Its Fun To Read” Jim, Mary and their dog Pal. Their little was simply called “baby”. I have another called “A Book To Read”. It is easily one of the earliest of the readers in terms of ability levels. No sentences longer than 7 words. ^_^ Bothe are from the NSW Department of Education as well. Remember learning about the rivers as you grew older? Yes! 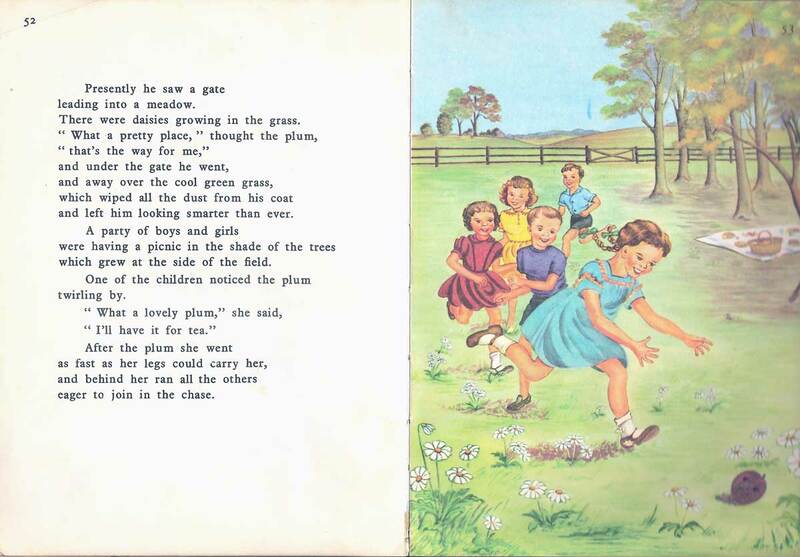 I was a NSW primary-schooler in the 80’s, but my grandmother had The Open Road book and she read it to me every time I stayed with her as a child. It is one of my favourite childhood memories. She would read me the WHOLE book at bedtime, then often she would start again from the beginning if I was still awake. Thanks for the pictures – I’ve been looking online too. How very nice of you to take the trouble to post this. I had this book as a school reader when I was in Kindergarten or maybe Grade 1 in the mid -1960s in the Sydney western suburbs. Why does a particular story click with you? I have no idea, but I do know that I have never forgotten this story. I have tried to find the story many times, particularly when my daughter was young. Now, thanks to you, I will have it for my grandchildren. And by the way, I always liked the idea of travelling and seeing the world – just like the plum. I am now 55, living in Rome and working for the United Nations, and I am sick of travelling and seeing the world. I think that like the plum, it is time for me to stop and watch the world. Many thanks to you. Thanks for uploading ‘The Rolling Plum’, John. I just loved that story when I read it in infants school. I can recall identifying strongly with that plum! I loved its escapades, – probably because the 50s was a very dreary time (on looking back). Even though the fun had to come to an end, it seemed a very good ending to me then and now, as the plum contributed something of value to others. I’ve just finished my 40 years of ‘escapades’ as a state school teacher, and hope that I will continue to contribute! Thank you for your thoughtful comments. Yes, this story has stayed with me all my life. I first read the story during 2nd grade in 1966. I remember the classroom quite well. I love to travel like the plum as well. Those were the days. I loved Open Road and Travelling On, too! I do remember The Rolling Plum. I also remember two raindrops called Pitter and Patter, a beautiful chinese umbrella, and a very vague recollection of a story about the Australian bush. Was there also a copy of Bellbirds in one of the books? We went on in older grades to read SRA cards and strive to complete them so we could get higher colours, but it was competitive, not enjoyment. I also recall cloth-covered books in 6th class. One was Simon Black in Space. Another was Children of the Dark People, by Frank Dalby Davidson. I kept my copy of the latter for many years, and it fuelled the games we played in The Bush opposite our house in Sydney. Thank you Susan. Yes indeed, Pitter and Patter feature and their amazing adventure has also stayed with me. ^_^ Cheers, John. Thanks John for the pictures from Open Road and story. I grew up in NSW during the 1960’s and had “Open Road” as a reader and there was another one too. I think it had a tan cover and was called Travelling On or something, I think it had a kangaroo on the cover. I have been trying to find a copy of either of these books because I loved them. The pictures and stories really sparked my interest in reading. I still think of the rolling plum but as in life, we all have to put down roots sometime. We had the Open Road reader in my Catholic primary school in Sydney in the early 60s. I was amazed at the images that the artist drew, many of which stay in my memory even now – scenes of little elves in brown tunics building cottages but forgetting to allow for windows or a chimney (! ), secretly helping the cobbler’s family with its overnight shoe repairs (and receiving brightly coloured tunics in surprise payment), an underground grotto where fairies hung about, and, most of all, a koala who, from his gum tree on a hillside at night, looked out into the dark and wondered what the city lights in the valley below promised. I bought a second hand copy in a shop about 20 years ago and gave it to my sister for her daughter. Sadly, it did not survive the ravages of a younger sibling. I should have been more insistent. Since then, I’ve always wanted to find another that I could keep for posterity’s sake. A beautiful book. Years ago I was asked a question by a therapist: What is the earliest fictional story you remember in detail? She explained that that is the story that resonated with you so much that you remembered it, and that it often seems to describe your life later on. My earliest is The Rolling Plum, and it does indeed describe my life! Thank you for reprinting this magical story here. Hi, I have searched for a copy of Open Road for years. Any chance you have a copy. I particularly remember The Apple Fairy, The The little boy on crutches who lead the children through the opening in the rocks. Thank you for the email. I am sorry that I do not have a copy. I hope you find a copy one day. Thank you so much for this step back in time. 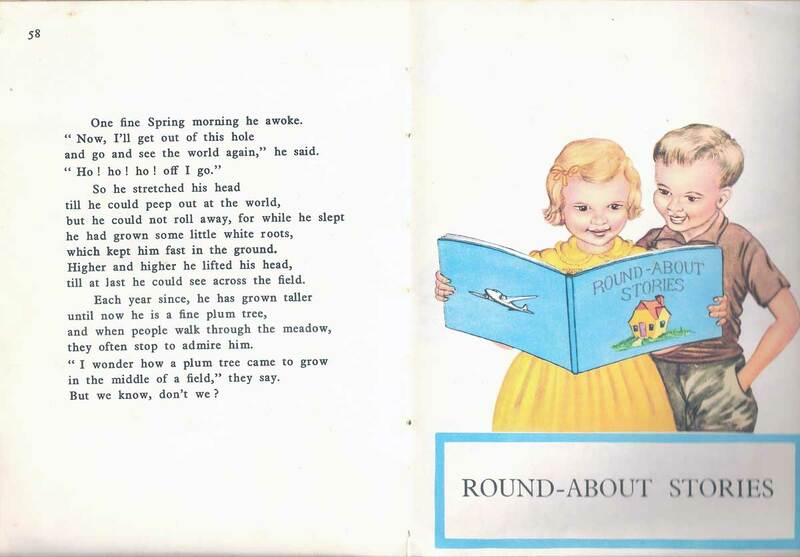 I found this page by googling ‘Open Road to Reading’ as I was reminiscing and wanted to see if anyone else remembers this book. I absolutely loved it, and no matter how many times I read it I wanted more. I went to a Catholic primary school in Sydney and I was first given the book in 2nd class in 1974. So glad to see that this reader is so fondly remembered by so many. Thanks again. I remember reading these books at primary school in NSW. Obviously these books have left a lasting impression on us all so much for TV. I wonder how many students across a state would now have a common memory such as this? Good to know that there are people with the same memories. I grew up in Canberra in the 1960s and remember being captivated by the David, Sue, and Wendy characters. I, too, became a teacher. I also remember the weekly broadcasts we listened to in our classroom along with a book to help us learn songs such as, “Oh, how I wish that I could be a little Aborigine.” I’m guessing they don’t use those books anymore. I just loved those readers. I remember the two rain drops Pitter and Patter as my favourite. Do you have any extracts with them in a story. I was in first class in 1967 in Liverpool NSW and I remember reading The Rolling Plum. I always remembered the beginning of the story because in class whenever we read, we always had to start from the beginning of the story and we always stopped part way through. It is fantastic that I found this site where I can read the ending. as it used to annoy me that I always remembered a plum that rolled on an adventure but could not remember what happened in the end. Thank you. I was one who read The Rolling Plum, and it was a wonderful story, which was useful to me throughout my life. We put on a play that I think came from the Open Road series. It was called ‘Umfoo….’ I would like to reread it if you, or anyone else knows of it, and has a copy. In the play Umfoo was a wild man from Borneo type character, who lived in the highlands of an equatorial forest and a group of intrepid tourists ventured to find and observe him, led by a dodgy guide. It had a twist at the end, which seems to me now to e very adult and cynical, but it was my favourite play. Any help tracking it down would be much appreciated. I also first read it in primary school. 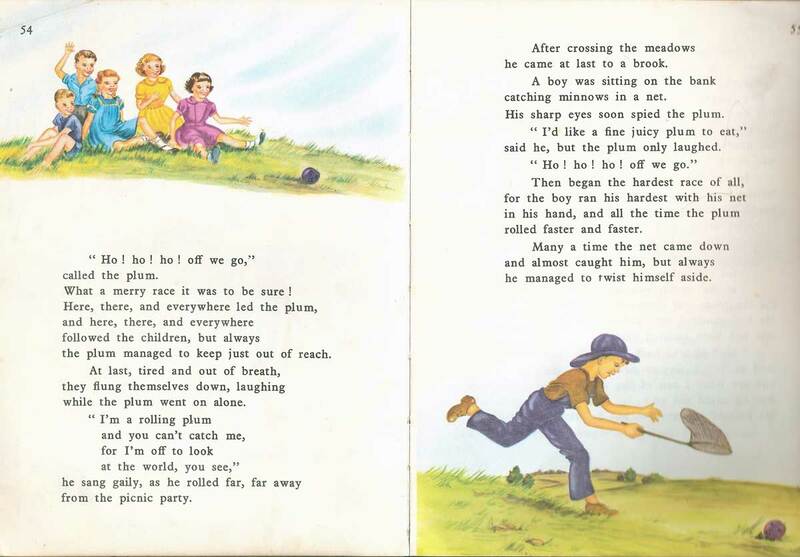 I have been searching for this story for years for my nieces and nephews to whom I relate the story often and they love it and repeat the plum’s rhyme, which I had to make up as I didn’t quite remember it but I knew the gist of it. Amazing to find all this web talk on the rolling plum. I remembered nothing of my early reading years in the 60’s except for this story. I googled it a while ago before this blog was active and found only one reference to it. This gave me the open road reader reference and I managed to find a copy on abebooks.com.I now realise how lucky I was to get this. At the time it was the only copy listed. When I received it… what flashbacks!The blue cover with the little girl in pigtails made me realise how some things can remain hidden in your subconscious. I turned to the appropriate page fascinated as to why this story had remained in my memory even though I remembered nothing but the title. I saw the rolling plum escaping from the children and read the story of travels and seeing a wonderful wide world. All this has been my life. It shows how much of our personality is already present by the time we begin to read. I have a seed from a plum that one day I will plant when I am ready to settle in one place…if ever! As a footnote. 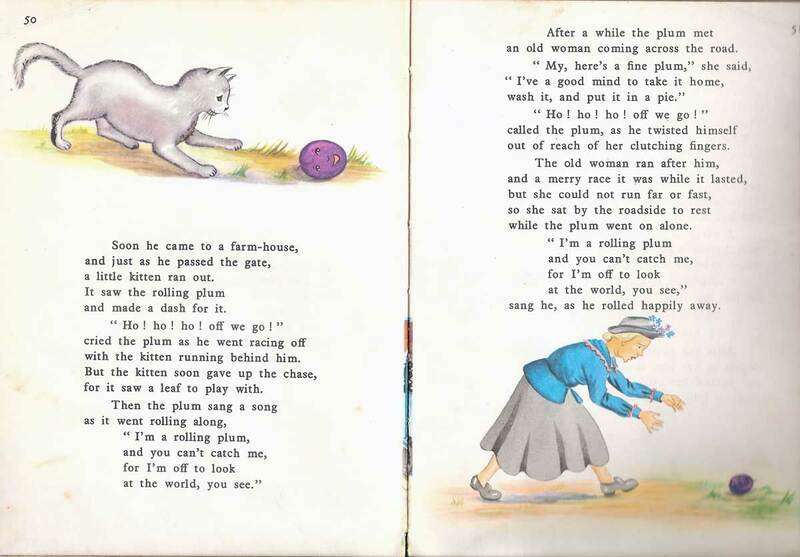 The rolling plum was taken from a 1944 b & W classic “Stories to tell in the infant school” by Roselin Cole published by MacMillan. Last time I checked there were copies available on http://www.abebooks.com. I have been searching for this book also. It was my home reader when I was in infant school in the mid 80’s. I had been allowed to keep it (probably because it was already quite old material by then). I so regret that we didn’t keep it. I loved that book. I loved this book too. My favourite story was called “The Apple Fairy” from memory. It was my home reader in infant school during the mid 80’s and I had been allowed to keep my copy. I no longer have it though – it must have been discarded during a clean out. I so wish I still had it now to share with my children. I too remember those reading books from St Columbkilles – and who could forget Sister Philomena?! You may not be checking posts anymore however…I went to the same little primary school as you did…well all of the nine Burke kids did. You captured the feel and memories of St C so well. 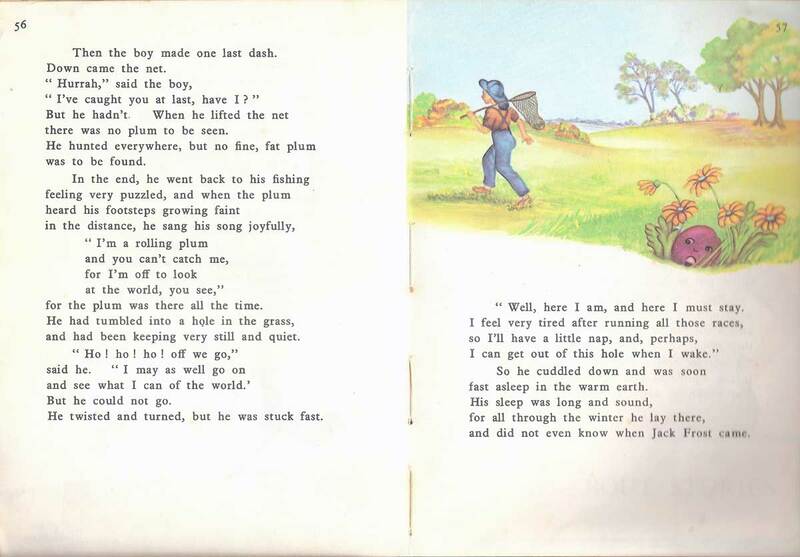 I came across this article by chance and was so happy…I have been searching for my favourite little book “The Rolling Plum” for many years with no success! Please steer me in the right direction if you ever hear of another copy. When were the Burke kids attending the St Columbkille’s? Three of us were there in the sixties. I finished Year 6 in 1970. What a lovely surprise to learn there are others that treasure this book & the stories. I have a copy of the book, which was given to me by my niece in about 1990. She had a copy from school & was happy to let me keep it when I told her of my love for the stories. Especially The Rolling Plum, The two little raindrops & The Elves & the shoemaker. The stories were lovely, the illustrations beautiful & it certainly makes me so nostalgic for when times were simpler & innocent as kids. I read & reread the stories so many times as a young kid, I think it kickstarted my love of reading. I went from that book to the Famous Five stories. Thanks so much for the scan! I am a primary school teacher and today was telling my class about how different lessons were in my school days. I recalled my Open Road reader and told them my favourite story was of the runaway plum. So I googled it and up came this page..with scans I could share with them! Wonderful. Please scan more stories! I have been searching for years for any information on The Open Road and couldn’t believe I’ve achieved my goal. I attended Sacred Heart School Darlinghurst and this book really made an impression on me even though it was 60 years ago. I remember the two raindrops and can still see them clearly in my mind and as for The Rolling Plum, well as soon as I saw his little face it was instant recall. Took me right back to the classroom. Thankyou so much for helping relive a bit of my childhood. And may THE PLUM keep rolling. I still have the Open Road to reading book, I loved it as a child, I was only reading it to a child at after hours day care the other day, she loved it . Reading your blog brought back so many memories. I too was taught in the catholic system in grade 2. Loved the book and could not wait to read it. One thing has stuck with me is a poem I think that was at the opening of the book. ” The Open Road is a friendly road I love to travel daily. The kindly folk I meet and greet and talk to them so gaily…..” I would love to know who it was written by and if I could find a copy of it. I am searching for the David Sue and Wendy book. Do you have a photo of the cover of the book with David, Sue & Wendy that you could send me please ? Or describe it ? I loved the Open Road. 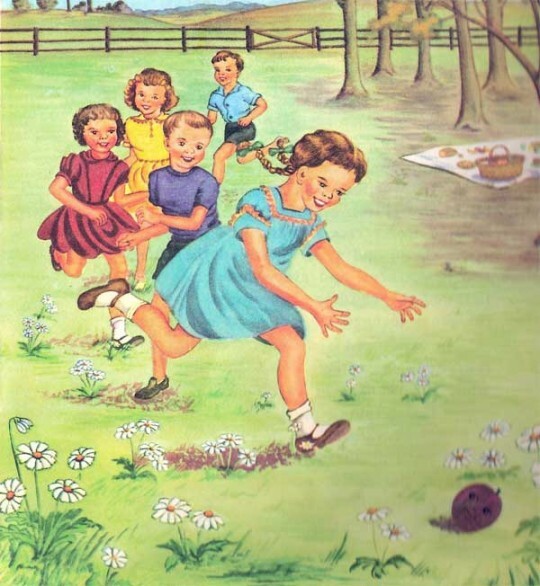 I remember with happiness the rolling plum, the Brownies house but my favourite was the Apple Tree Fairy. I too am seeking a copy for my grand daughter now learning to read.